We've been over the river and through the beautiful woods of Arkansas and Missouri in the last few days to visit our oldest son for his 26th birthday. He's there working for a few months and we've used any and all excuses to go see him. I really enjoy road trips with my husband. We realized a couple of things this weekend. First, we've had our oldest son half of my life!! Math is sneaky and since he's 26, I guess I can't claim to be 30 something. Well I could but that would be just wrong! What really caught my attention this weekend was to realize that both of my sons are in love. Do you remember when you first fell in love? That's the most perfect feeling in the whole world! just like we do with zinnias? Lovely post. Aren't road trips the best? I know doesn't the years creep up on you? I have a son that will be 28 soon, just can't believe it. Love the zinnias too! Hope you had a lovely time celebrating your sons birthday! Young and in love...wonderful! Beautiful blues and blooms...the perfect combination. Stacey, we love road trips so much that we bought an RV when Ron retired. Love it. What a lovely, happy post, Stacey...young love! And zinnias are my FAVORITE flowers! What's better than love, and flowers and road trips?! So happy for your family and your sons. Sounds like you're having a lovely summer! I remember every time I look at my sweetie :) He is just as precious to me now as he was then, maybe more so! Where do the years go and how do our kids get so grown up? I have a 25 year old and a 23 year old, both married, so seeing the young love has been pretty adorable. I'm not one for long trips in the car, but I'll do it to go see my girls! How exciting for your sons. So fun to be young and in love. Glad you had a great visit with your oldest. Great post! Love taking road trips with my husband. We always seem to make plans and dream about the future. Lovely thoughts and photos. Greetings! Hi Stacey, sounds like such a wonderful road trip to see your son. Talking lots in the car driving is something we do as well and so enjoyable. So special for you to see both your sons in love. 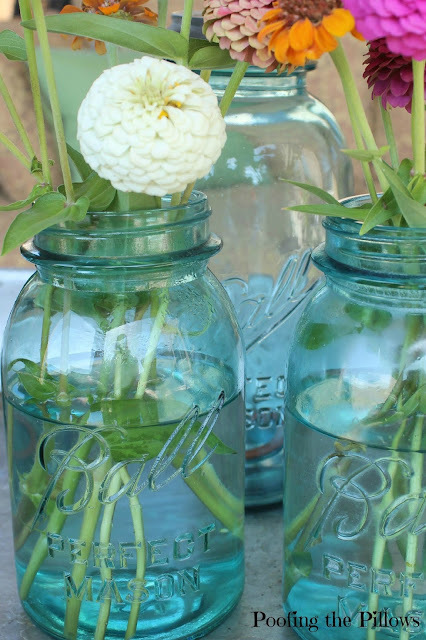 Gorgeous ball jars filled with blooms. It just says summer! Lots of special moments in life are deserving of being kept in a pretty blue jar. Love this post! Oh Stacey, what a loving and precious post! Now, that jar filled with awesome and loving feelings sounds perfect! Your sons are blessed! Such a happy post, Stacey!! Nothing better than seeing our adult kids responsibly moving forward in life, especially if they've also found a soulmate! Your blue ball jars with zinnias are also so pretty and add such a bright spot in your home! Young love is always the best! So exciting and new. I had to laugh at your comment in this post about claiming to be 30. When my older daughter turned 30 I said how can that be I am 30!!!! 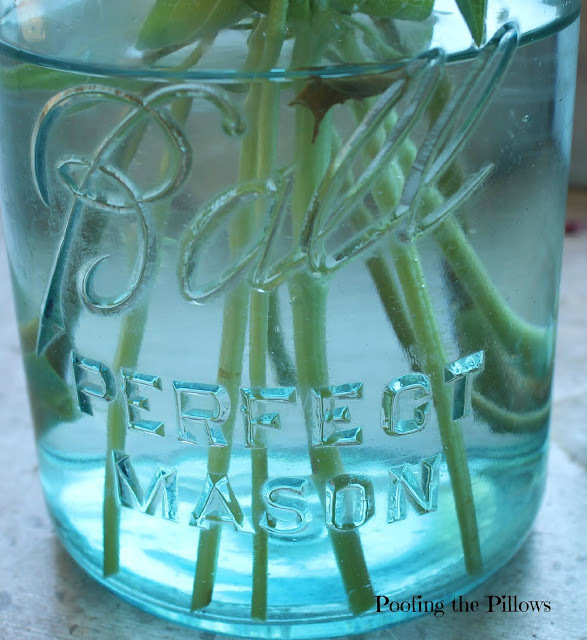 Love the blue ball jars with your pretty flowers. So pretty. I love those road trips too and having that time to talk. Glad you had a great trip. Such lovely photos! I remember being in love for the first time-best feeling! 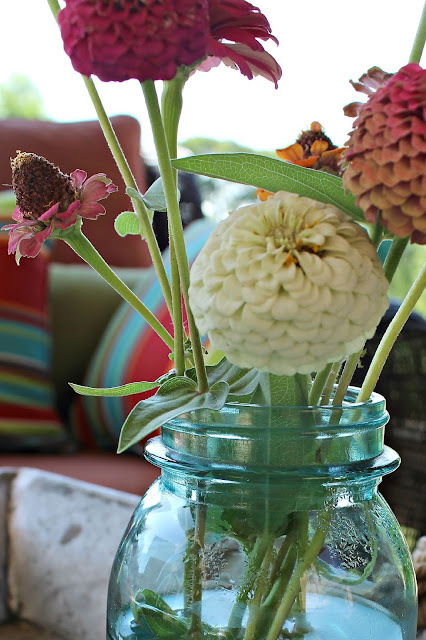 Love the blue jars and the zinnias! I also like road trips with my husband. So nice that you get to visit your son often. One of the main reasons we downsized and moved was to be closer to our daughter and son-in-law. Beautiful flower photos! Ah, young love...so fun! I imagine it is quite different now with texting, etc. I wish I could take road trips, but I get really car sick. We drove to Galveston yesterday and I almost couldn't make it. It only takes about 45 minutes for me to get queasy. 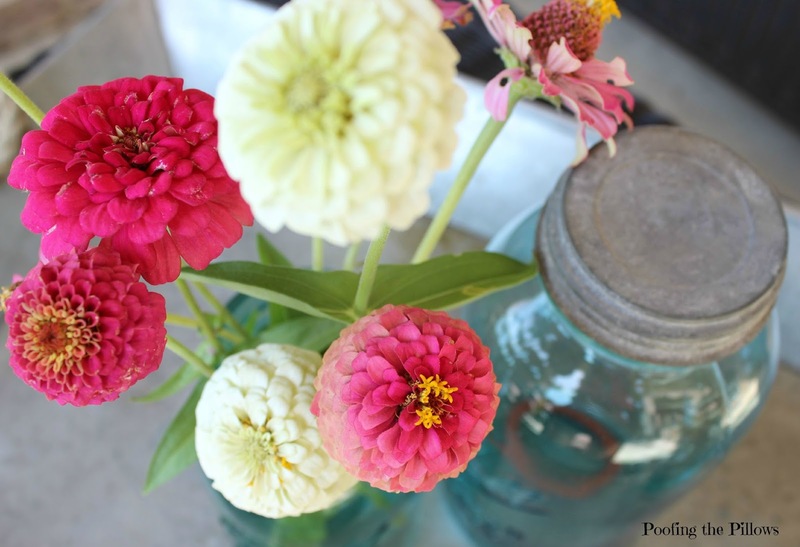 :) Love your zinnias! I need to go water mine now. Our heat is unbearable. I do think that one thing that is even better than being happy is . . .
That's so nice! My 21 yr old son just moved out last month. Luckily he only lives about 30 min or so from us. I know how it feels to be excited to get to see your son after he's been gone for awhile. Sounds like you may be having a wedding in your future. It's nice that your son's have found someone to love. Mine are still young and not there yet. Hi Stacey, I love love love road trips as well. We just got back from one. I checked out the book you recommended, "whistling past the graveyard".....I have still not got started on it! !....but hope to this weekend. I'll letcha know if I like it! What are you reading now? Aah, young love! This is the perfect jar for it,large with a wide mouth for gulping it down. What a beautiful thought. Absolutely lovely pictures and such nice thoughts! Glad that you had a nice drive and a great visit...Love conquers all! Love the beautiful pics!...Have a great weekend! Love all those pretty zinnias. So glad you're enjoying a wonderful summer! Aw, Stacy....this is such a sweet post! 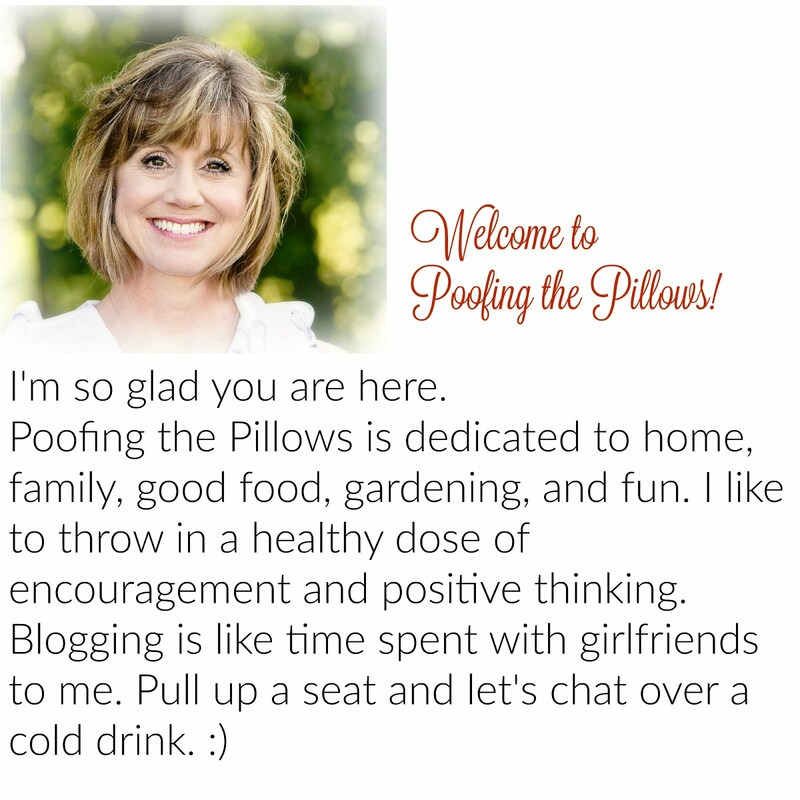 Have you met the young ladies yet? Hi Stacey! Glad you're having some nice road trips and getting to see your son. You're a lovely lady no matter what age. I would think you're 30! Yay to love too! Yes, I am really enjoying the cooler summers up here. Would you believe for the last three evenings, we've raised our windows in the bedroom and sleep cool all night long! I don't miss Texas heat! Stay cool. I love this post, Stacey. So sweet. Life doesn't get much better than seeing your children so happy. Hugs!